Former NFL and Virginia Tech safety Keion Carpenter died Thursday morning after suffering a brain aneurysm while running in Florida. He was 39. Carpenter was on holiday in Florida with his family when he collapsed. He was pronounced dead at Jackson South Community Hospital in Miami. Carpenter joins the long list of stars and other notables who passed away in 2016. I didn't realize it was this long. ...death is harsh and don't care who wins.. Dang!!!! So so sad....I dont see Gwen Ifill on this list. She reminded me of my auntie ya'll. Can you imagine the list of non-celebrities who died this year? Be grateful for your lives people. You never know when it will end. How dare you!!! Leave Betty White alone!! My childhood friend passed yesterday morning. I lived across the street from him for over a decade, so we grew up together. He just celebrated his 30th a couple of months ago. Heartbreaking. I'm so sorry Buttercup. It's extremely hard to lose someone especially someone whom you've known for practically your whole life. I dont know you but I do know what you are feeling and my thoughts and prayers are with you sweetie. SANDRA WHEN YOU WISH DEATH ON SOMEONE KARMA MAY PUT IT ON YOU. THE BETTY WHITE THING WASN'T COOL. SMH!!! ANYWHO WOW 2016 HAS BEEN A BEY-0TCH FOR CELEB DEATHS........JENNY JONES!!! Girl, Sandy over there reading these comments and updating it as we tell her who she forgot. I had refresh just to have her name appear. Is the list dynamic content? I don't see Betty White on there. Wait the fashion icon Gwen Ifill? Did we need this? Good Lord. Bless them all Lord. Oh man. I'm sorry for such a loss. Yes she did and took poor Betty White's name off too. God don't like ugly Ms. Sandra! Was she a fashion icon? Not sure. She was a journalist who was on PBS for years. My grandpa used to watch her every night. Ahhhh, that makes sense. Thank you. https://media3.giphy.com/media/3o6wrebnKWmvx4ZBio/200.gif#15 There did seem to be a LOT this year.... so sad. I didn't know Gary Shandling died! To the Beautiful Roses, much and as often as you can, Live life to the fullest. When a bad joke goes wrong, Betty might outlive you. Cheers to that hun ? I give it 6 months, max. Why she have to be a hoe? Which proves that once you go black then try everything else in between, you do go back, sort of. Maybe the hoes will be able to tame each other. They won't though. Drake will be back in love with Rih by Valemtime's Day. The queen definitely will outlive us. She's probably on her 4th heart rat nie! From what I read, he was running to the car with his son (possibly racing) and the fell and hit his head. But nonetheless, he passed and my condolences go out to his family. I'm so sorry to hear that, Butter! Right, i didn't know he was dead until i saw a story today talking about his cause of death, making me think he died last week not back in March. I haven't even read the list. I seen Keion (the headline) and Natalie and dassit. lawd jesus keep your hand on us!! this year still isn't over and Im sure the grim reaper is looking for more to take in 2 0 1 6. So many good people left us... yet George Zimmerman is still with us. I thought the last day of December 2015 claimed Natalie Cole. F*** 2016! I lost 1 uncle and two aunts in 2016! Also f*** 2013 (lost my Grandmother) and 2014 (lost my Mom and friend Monique)! Fukked up, ain't it. I lost one on Christmas Day. Sorry for your loss. 30 is SO young! I want to ask how. But that might be too imposing. But 30? Yeah, too young. Since then? Good Lord. Really? Wow. Two hoes in a publicity relationship. Wow! He was only 39!!! So so very sad. May he rest in peace. gurrrl yes... pour out alotta liqua ! Yes girl. It was known. I'm sorry for your loss, too! My condolences. He was "how you doing," so we suspect that it was HIV or AIDS. He'd been in and out of the hospital over the last year or so. I guess I thought that he was young and vibrant enough to pull through. Everybody plays the fool.....sometiiiiimmmes. She just got tired and needed to change places. I don't. Not regularly. Media sux for the most part. *screams* You ain't never lied!!!!!! It's crazy to think she was dating Diddy. 17 years ago. She back with Ben Affleck and using Drake as a distraction. She doesn't want to get blamed for helping break up his marriage. Oh wow! SO sorry to hear that. I've been bummed since Christmas. PP's home and I've been moping around. Sad. Awwww. Mope around as much as you need to. My friend's funeral is Saturday. I don't think I can go. I'll just send a nice flower and a stuffed card to his folks. He nursing his wounds...professed his love for Rihanna then got swerved and dumped ? Why did they get matching tats then? Did Big Ang die this year as well? Cause they are friends. Like Homies. Thank you. Y'all know my philosophy on death. It's only for my own selfish reasons that I will miss him. He's no longer suffering, and hopefully at peace. She did!!!! I forgot about her!!! I sit in the back. But I gotta be there for my homegirl (his sister). what makes him lame? His lyrics? His white mama? Degrassi? His groupie like behavior? ? Bobbi Kris was 2015, right? My years are blurring together. That's me with days of the week. Take Prince off the list!!! ?????? I'm super late with that one. THIS TOO! I didn't know when Christmas was. Nor was I aware that NYE/NY day is like two days away. Had no clue. Sweatergawd. You forgot Vanity. She was right before or right after Prince. OMG Keion! Peace and Blessings to his friends and family. My cousin had a crush on him when we were 13..[[CAMPFIELD]] He bought us Champagne when he was with the Buffalo Bills and came back in town...Holding my fam closer!! Poor Mike Pence. When he's with Trump he always has this look on his face like "how did I get stuck with this crazy guy?" Thank you. I only know stage names. 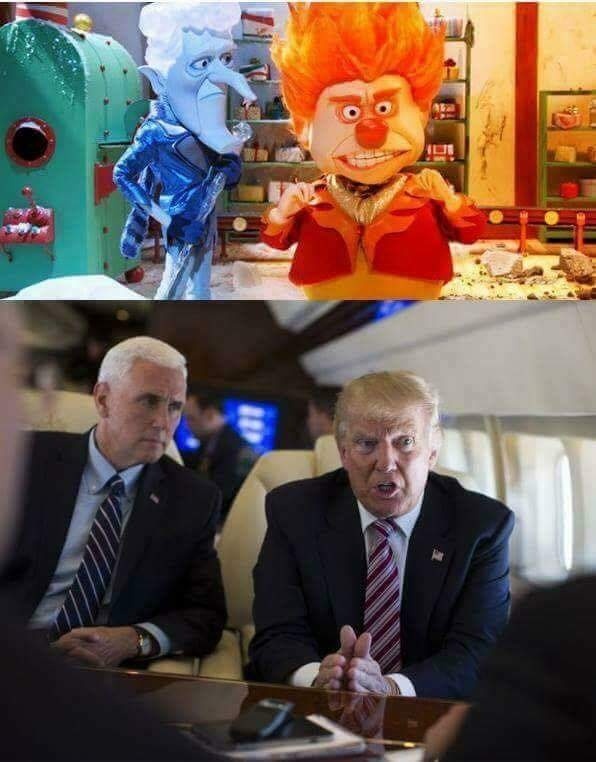 I really believe Pence is the scary one. We all know the Orange Man ( aka Mr Heatmeister depicted above) is just blowing hot air. But, Pence.....the unknown factor is going to make us tremble in our boots. Death is normal. Even "stars" cannot escape it. I gotta go check on my quiche. let me take that back. It had Maurice White. Wow I didn't know Zsa Zsa Gabor died, she was almost 100 yrs old in 2 months. 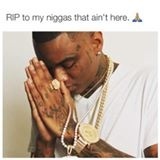 RIP! Yeah as soon as I wrote that I wasn't like wait, that's the JOURNALIST!! The major journalist! My bad. I imediately was thinking of Iris Apfel!! I'm sorry. Wasn't thinking. But goodness gracious... Its painful to see that people you "know" and see everyday (on tv) are not here anymore. This list is janky as fck. Where's Shawty Lo? Natalie Cole actually died December 31, 2015. Miss her just the same.